A quick post whilst at work. 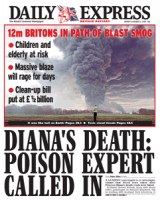 Last night I was joking with Heather that the front pages of all the newspapers would be covering Hemel except the Daily Express, which would of course be coving another Diana story. Am I really suprised that I got it right? I’m surprised they didn’t point out that the plume of smoke looks a bit like a face. Maybe not Diana, but could that be Dodi…?